Floristic diversity, dominance and abundance to frequency ratio of tree, sapling, seedling, shrub and herb species were studied in two different forest sites of a tropical foot hill region of Garhwal Himalaya. In tree layer on both the sites the dominant species recorded were Lannea coromandelica (IVI-39.80) and Anogeissus latifolia (IVI-29.50) on site I and site II respectively. The ranges of diversity for tree layers was 4.580 to 4.643. Most of the species on both the sites were contagiously distributed except few species which were distributed randomly. The temperate forests of western and central Himalaya are usually distributed between 1200 and 3000 m asl which is the preferred zone by habitation and characterized extensive oak and coniferous forests. Puri (1960) considered that these forests represent climatic climax of one or other species of Quercus in upper altitudinal zones. The lower elevations of the temperate forests are occupied by oak-pine mixed forests and Quercus semicarpifolia with other coniferous at higher altitudes, normally form the climax vegetation. Other species of oak are found above the oak-pine mixed forests of Garhwal Himalaya (Osmostan 1922). The oaks are the most preferred tree species in the entire region and used mainly for fuel, fodder and small timber. In the lower altitudes (upto 1000m) generally the forests are dominated by Shorea robusta, alogwith Anogeissus latifolia, Terminalia species and Adina cordifolia (Kumar et al. 2004). The various changes in the Himalayan forests are appearing in their structure, density and composition due to global warming (Gaur 1982), uncontrolled lopping and felling of trees for fuel wood, fodder and grazing (Bargali et al. 1998; Kumar et al. 2004). These biotic pressures which play an important role in forest community dynamics (Whitemore 1984; Pickett and White 1985) often regulate the recruitment and survival pattern of tree seedlings (Canham and Marks 1985). Each form of biotic pressure has different effects on the subsequent development of vegetation (Loucks et al.1980; Pandey and Singh 1985). Several workers reported the status of forests and their management in the Himalayan region (Singh et al. 1981; Ralhan et al. 1982; Saxena and Singh 1982; Saxena et al. 1984) however, these studies are very limited to population structure in the part of Garhwal Himalaya and other parts of Central Himalaya. Therefore, the present paper deals with the analysis of vegetation and biotic pressure on forest in Kalsi range of Chakarata Forest division of Garhwal Himalaya. The present study was carried out in Kalsi range of Chakarata Forest division (Yamuna valley), in two different sites i.e., site-I and site-II for comparative study of community composition and plant diversity, which is the part of the undulating terrains of Garhwal Himalaya (latitude 30 degrees 31' N and longitude 76 degrees 56' E) in District Dehradun of the Uttaranchal State in India. Altitudinally the region stretches from 700 to 1200 m asl, the Jaunsar-Bawar region which is remote and mysterious virtually isolated from rest part of the world. Since time immemorial, this mountainous region in the northern part of Uttaranchal has nurtured a unique life style. Climatically spring, summer, rainy and winter seasons are well marked in this region. The maximum average rain fall is experienced during July and August. The region receives an average rainfall 1610 mm annually. The temperature reaches up to 40 degrees C in the months of May to June whereas, the higher peaks of the area receive frequent snowfall during winter season. The phytosociological analysis of the forests of study area (Yamuna valley) was carried out during June to August 2004 by using 10 x 10 m quadrats for trees. Each quadrat was subdivided in to 5 x 5 m sample plot for recording shrubs+saplings and 1 x 1 m for herbs+seedlings. The quadrats were laid out randomly throughout the study area. The size and the number of quadrats were determined by the species curve (Misra 1968) and the running means methods (Kershaw 1973). Thirty quadrats were randomly placed in the entire area, representing all the vegetation type and localities. In each quadrat, trees were recorded with >31.5 cm cbh (circumference at breast height i.e., 1.37 m above the ground) individually measured. Individuals within the cbh range of 10.5 to 31.4 cm were considered as shrubs+saplings and individuals < 10.5 cm cbh were considered as herbs+seedlings. The vegetation data were quantitatively analysed for abundance, density and frequency according to the formulae given by Curtis and Mc Intosh (1950) and Mishra (1968). The relative values were summed up to represent Importance Value Index (IVI) as per Curtis (1959). 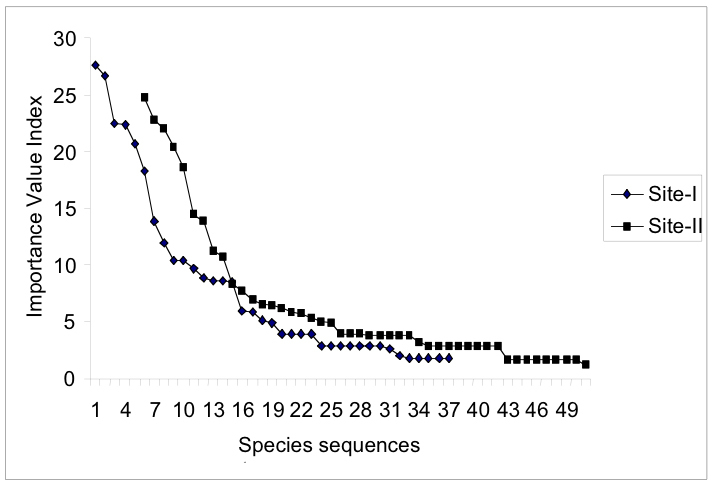 The distribution pattern of species was studied using the ratio of abundance to frequency if below 0.0 25 indicates regular distribution, between 0.025 - 0.050 indicates random distribution and when exceeds 0.050 indicates contagious distribution (Whitford 1949). The diversity index (H) was computed by using Shannon-Wiener information Index (Shannon and Wiener 1963).The concentration of dominance (CD) was computed by Simpson's Index (Simpson 1949). The dominance-diversity curves for trees, shrubs+saplings, and herbs+seedings were drawn on the basis of importance value index (IVI). The utility index of important species of the sites were collected with concerned literature as well as the information collected from villagers. In the site-I of tree layer, a total of 33 species were observed. 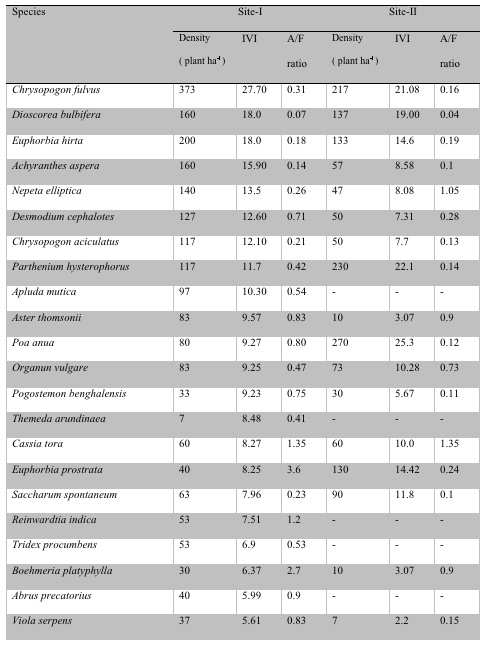 The dominant and co-dominant species were Lannea coromandelica and Terminalia bellirica, showing their values of IVI of 39.80 and 30.90 respectively, whereas, the highest (117 plants / ha) value of density was also recorded for Lannea coromandelica. 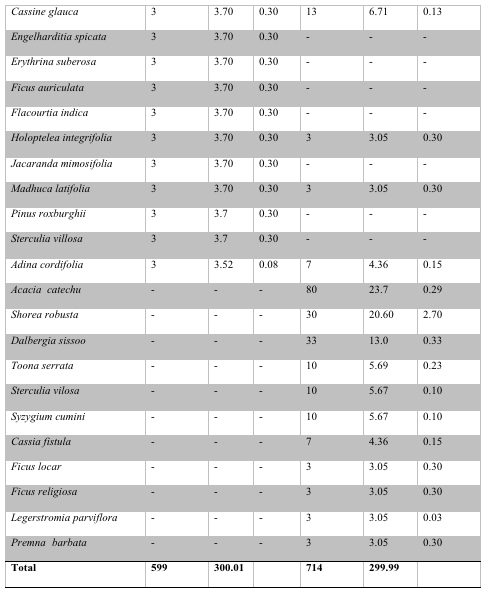 Most of the species on the site showed contagious distribution pattern, except Lannea coromandelica which was randomly distributed (Table 1). Table 1. Phytosociological analysis of tree species on site-I and site-II contd. In the tree layer of site-II a total of 34 tree species were recorded. Amongst the trees the highest value of density (100 plant ha-1) and IVI (29.50) was recorded for Anogeissus latifolia. The co-dominant species of the site was Terminalia bellirica which showed their values of IVI (29.0) and density (90 plants / ha). The distribution pattern of all the species on the site was contagiously distributed except Lannea coromandelica and Terminalia bellerica, whose indicated random pattern of distribution. In the shrub layer of site-I the highest value of IVI (26.70) was recorded for Adhatoda vasica, whereas, lowest (IVI-1.77) for Agave americana. 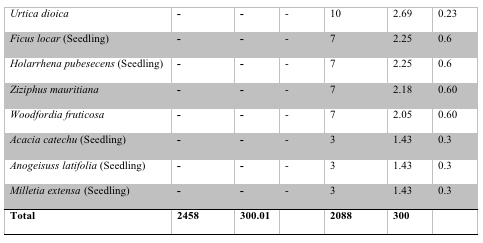 In sapling layer the highest (140 plants / ha) value of density was recorded for Boehmeria rugulosa and the lowest for Pyrus pashia 2.0 plant / ha (Table 2). Table 2. 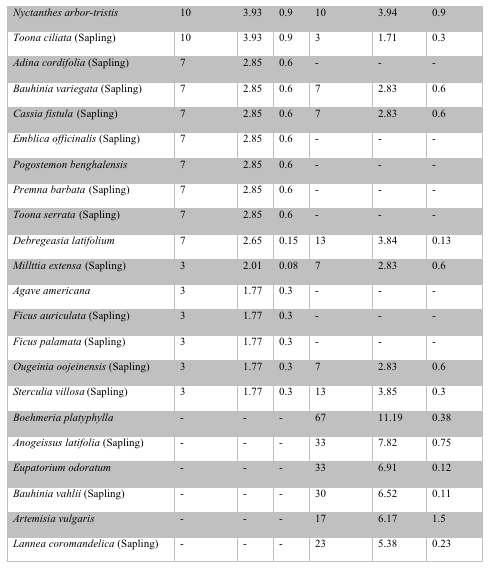 Phytosociological analysis of shrub+sapling species on site-1 and site-II contd. 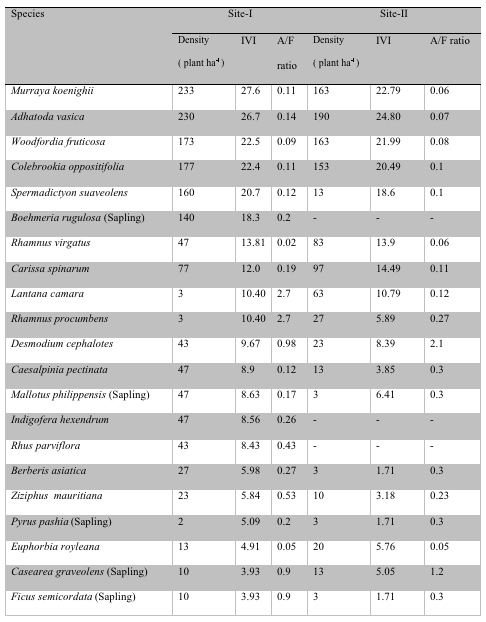 In the herb layer on both the sites-I and II, the most dominant species was Chrysopogen fulvus while the least dominant species on site-I was Artemisia vulgaris and Thalicturm foliolosum and on site-II Artemisia vulgaris (Table 3). 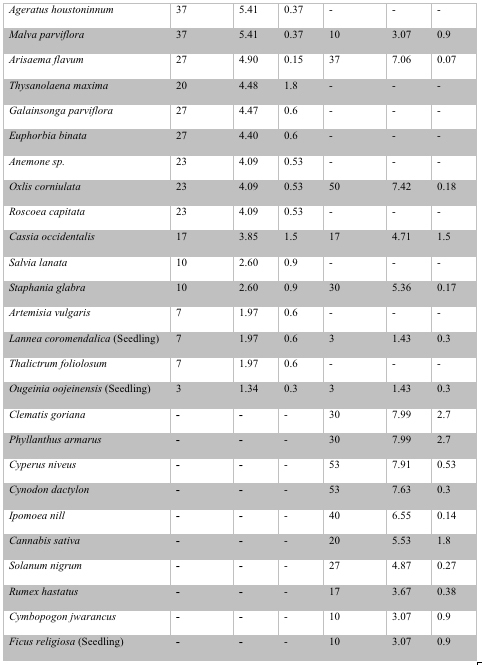 For seedling, in site-I only two seedlings (Lannea coromandelica and Ougeinia oojenensis) were recorded whereas, in site-II the total number of seedling were eight (Table 3). Table 3. 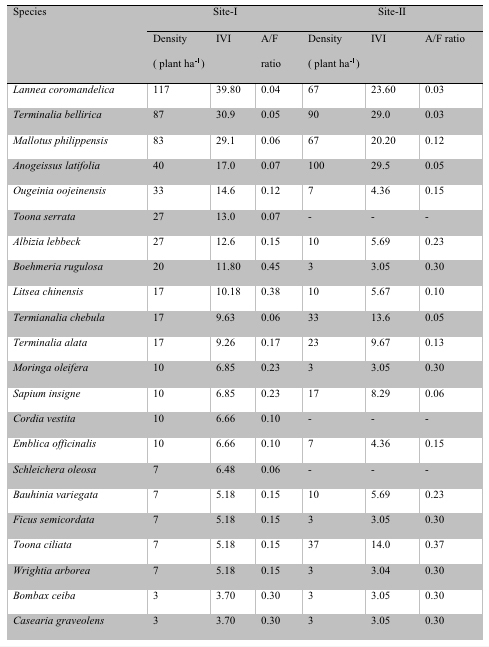 Phytosociological analysis of herb+seedling species in site-I and site-II contd. The diversity of study sites have been described in Table 4. The maximum (4.643) value of diversity for tree layer was recorded on site-II, whereas, minimum (4.580) was observed for site-I. In the shrub+sapling layer the maximum (5.021) and minimum (4.695) values of diversity were recorded on site-II and site-I respectively. In the herbs+seedlings layer, the minimum and maximum values of diversity were recorded on site-I and site-II respectively. The lowest (0.053) and the highest (0.114) values of CD for tree layer was recorded on site-II and site-I. The ranged values for shrub+sapling and herb+seedling species were 0.040 to 0.049. 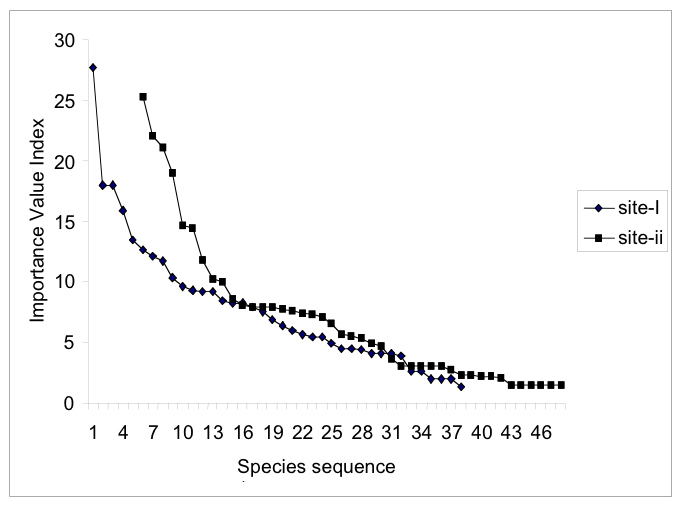 Dominance-diversity curves plotted between importance value index and species sequences of trees, shrubs+saplings, herbs+seedlings (Figure 1-3) indicate a relationship between different species showing importance value on both sites. In the present study two sites i.e. site-I and site-II were recorded because foothill belt of Garhwal Hiamalaya consist of thickly populated village and each village exploits forest resources for their basic needs from these forests (Kumar et al 2004). Due to over-exploitation and illicit felling as well as ruthless exploitation, most of the valuable species are either disappearing or rarely available. 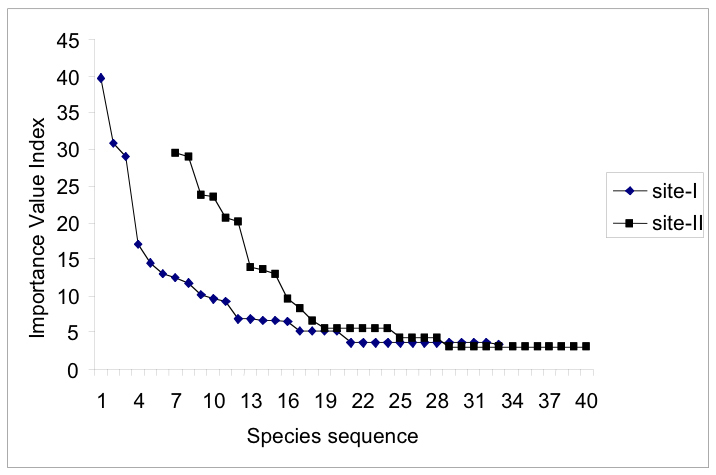 The abundance to frequency ratio indicated that most of the species of shrub+sapling, herb+seedling and trees were contagiously distributed except few species of trees, which showed random distribution pattern. Contagious distribution in natural vegetation has been reported by Greigh-Smith (1957), Kershaw (1973). Similar finding also reported by Kumar et al (2004) for tropical forests of Garhwal Himalaya. 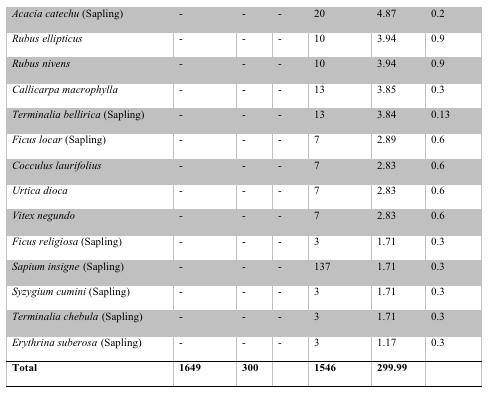 In present study the range of diversity were 4.580 to 4.643 (for trees), 4.695 to 5.021 (for shrubs+saplings), and 4.962 to 4.986 (for herbs+seedlings). The ranges of diversity were high on the sites due to disturbance and invasion by new species. In Table 4 indicates that increasing diversity and reduced concentration of dominance has been shown to be associated with increased stability (Mc Naughton 1967). Pandey and Singh (1985) have also reported increasing species diversity in disturbed ecosystem of Kumaon Himalaya. Disturbance has always been considered causes invasion and species replacement, altered, growth, establishment, germination etc. the disturbance affects the stability of the ecosystem and the successional process of the area. Disturbance caused by sever grazing arrests the ecological determinations. However, grazing animals which consume the ground vegetation plays positive role in dispersal, establishment and growth of such species by scarification and pelletization of seed (with dung). Forest is a living resource. A large number people of the hill and plain area depends on forest resources. Forest constitutes the richest resources amongst the other resources of the world. They are the vital component to sustaining the life support system on earth. Forests have been playing a pivotal role in the socio-economic development of a country or region. They are the important source of subsistence, employment, revenue earning and raw material to various Industrial uses. There role in ecological balance, environmental stability, biodiversity conservation, food security and sustainable development have been widely recognized. Forests are the source of various components, e.g., food, fodder, fiber, medicinal, tannin and oils, gum and many other things for human benefits. Generally it is observed that the forest areas in the vicinity of the villages have been degrading much faster rate than the forests growing far from the village locality. It is due to easily accessible to the villagers for their basic needs. As per the data collected from local inhabitants and concern literature revels that the forest resources of the area is rich for human benefits (Table 5). Therefore, there is an urgent need to conserve the forest resource both macro and molecular level for human and sustainable development of environment, besides that awareness to the villagers is essential how they can develop suitable techniques for sustainable utilization of forest resources. Achyranthes aspera Local beverage, Medicinal. Adina cordifolia Toy and handicraft. Terminalia chebula Medicinal, fodder, dye. The methods basically used for conservation of biological diversity both (animals and plants) are in-situ and ex-situ conservation. Ex-situ conservation of species done outside the area where they are naturally growing (e.g., botanical, horticulture and recreational gardens) while, in-situ conservation is done in the natural habitats (e.g., area demarcated by under rules are National Parks, Sanctuaries, Biosphere Reserve, Preservation plots etc.). Besides this several other traditional methods are used by peoples can also considered i.e., (1). Sacred groves forest should be declared (2) Large scale cultivation of economic and medicinal valuable species should be encouraged to local inhabitants (3) Public awareness (4) Encouragement of social forestry programme for some essential species, for fuel, fodder and other purposes (5) Deforestation must be stopped by adopting law and regulation, should be developed by local village community and government level. (6) Plantation programmes should be made as compulsory for all villagers of the area. Keeping all the consideration for sustainable development of forest resources, emphasize should be given to develop suitable agroforestry, models specially selected multipurpose tree species in conjunction with agricultural crops over the same unit of land to maximize productivity and sustainable utilization of these resources. Bargali, K., Usman and. Joshi, M. 1998. Effect of forest covers on certain site and soil characteristics in Kumaun Himalayas. Indian Journal of Forestry, 21 (3): 224-227. Canham, C.D. and Marks, P. L. 1985. The response of woody plants to disturbance patterns of establishment and growth. In: The Ecology of Natural Disturbance and Patch Dynamics (eds. S.T.A. Pickett and P.S. White), Academic Press, Orlando, Fla..
Curtis, J.T. 1959. The Vegetation of Wisconsin. An Ordination of plant communities, University Wisconsin press, Madison Wisconsin, 657pp. Curtis, J.T. and mc Intosh, R. P. 1950. The Interrelation of certain analytic and synthetic phytosociological characters. Ecology 31: 434-455. Gaur, R.D. 1982. Dynamics of vegetation of Garhwal Himalayas. The Vegetational Wealth of the Himalayas (ed. G.S. Paliwal), pp. 12-25. Greig-Smith, P. 1957. Quantitative Plant Ecology, 2nd edition. Butterworth, London. Kershaw, K.A. 1973. Quantitative and Dynamic Plant Ecology (2nd Edition), ELBSD& Edward Arnold, London. Loucks, O. L., Ek, A. R.., Johanson, W. C. and Monserud R. A. 1980. Growth ageing and succession. In: D. E. Reichle (Editor). Dynamics properties of Forest Ecosystem. International Biological programme 23, Combridge University Press, Malta, pp. 37-85. Mc Naughton, S. J. 1967. Relationship among functional properties of California grassland. Nature 216: 168-169. Mishra, A., Mishra, L. Sharma, C.M. and Sharma, S.D. 2002. Community structure and growing stock variation on different aspects of dry semi-evergreen Shorea robusta forest cover type of Garhwal Himalaya. Annals of forestry 10 (2): 233-242. Mishra, R.1968. Ecology Workbook. Oxford & IBH, Calcutta. Motomura, I.1932. A statistical treatment of associations (in Japanese). Japanese Journal of Ecology 44: 379-383. Osmaston, A.E. 1922 Notes on the forest communities of the Garhwal Himalaya. Journal of Ecology 10: 129-187. Picktt, S. T. A. and White, P. S. 1985: The Ecology of Natural Disturbance and Patch Dynamics. Academic Press, Orlando, Fla.
Puri, G.S. 1960. Indian Forest Ecology 2 Vol. New Delhi. Rajwar, G.S. and Gupta S.K. 1992. Structure of forest vegetation of Garhwal Siwalik Hills between Khoh and Ganga. Indian Forester 118 (2): 148-165. Ralhan, P.K., Saxena, A. K. and Singh, J. S. 1982. Analysis of forest vegetation at and around Nainital in Kumaun Himalaya. Proc. Indian National Sciences Academy 348:121-137. Saxena, A.K. and Singh, J.S. 1982. A phytosociological analysis of woody species in forest communities of a part of Kumaun Himalaya. Vegetatio 50: 3-22 . Saxena, A.K. Singh, S.P. and Singh, J.S. 1984. Population structure of forests of Kumaun Himalaya: Implications for Management. Journal of Environment Management 19: 307-324. Shannon, C.E. and Wiener, W. 1963. The Mathematical Theory of Communication. University of Illinois press, Urbana. 117 pp. Simpson, E. H. 1949. The Measurement of Diversity. Nature. 163:688. Singh, J.S., Singh, S.P. and Shastri, C. 1981. Science of rural development in mountains. Gyanodaya Prakashan, Nainital, India. Whitford, P.B. 1949. Distribution of woodland plants in relation to succession and clonal growth. Ecology 30: 199-208. Whittaker, R.H. 1975. Communities and Ecosystems, 2nd edition. Macmillan Publishing Co., New York. 385.